Growing up I always thought that the reason for the constant increase in oil (petrol/diesel)prices was because it was a rapidly depleting non-renewable resource of energy. But little did I realize that it is the vast taxes, in countries such as India, that is the reason behind the Rs. 100+/litre price in India. The retail selling price of sensitive petroleum products for the consumers is calculated by taking into account price paid to the refinery, inland freight up to the market, marketing cost & margin, dealers commission, excise duty, and VAT & local levies. In the case of petrol, taxes are close to 50% of the retail price. For example, for petrol at Rs.100/litre; nearly Rs.50 is merely indirect taxes that goes to the government. The remaining Rs.50 is the actual cost of petrol, which itself is higher than the international prices. And within taxes, more than half comes from the excise duty alone. In the USA, the price at the gas station reflects the rise/fall of oil prices as in the international markets. There are days when the rates are as low as $1.50/gallon! Whereas the lowest retail price of petrol in a country such as India is Rs.65/litre(approx). ( 1 gallon=3.5 litre) This simple math must raise your eyebrows! So, how do economies world over deal with the fluctuating oil prices especially when the prices drop to the lowest rate as in recent times?! And, if oil is indeed a depleting non-renewable resource why are the prices coming down at all?! The oil producing countries of the world are part of an organization known as the OPEC(Organization of Petroleum Exporting Countries). Some of the member nations such as Iran, Venezuela, Ecuador, and Algeria have been pressing OPEC to cut production to firm up prices, but Saudi Arabia, the United Arab Emirates, and other Gulf allies are refusing to do so. This is the reason that in recent times we see a massive drop in oil prices. Saudi Arabia can to a large extent survive the current low rates because, when oil was $100+ a barrel, it saved more than it spent. The biggest losers are countries such as Venezuela, Iran, and Russia that didn’t keep much during their hay-days.In recent times non-OPEC countries such as USA, Russia have also started pumping more oil. Usually, the oil-producing countries economy draws more than 70% of their revenue from their oil sectors. When revenues fall drastically due to low oil prices, governments such as those of Angola, Nigeria are forced to slash spending, freeze development projects, delay payment of salaries, etc. 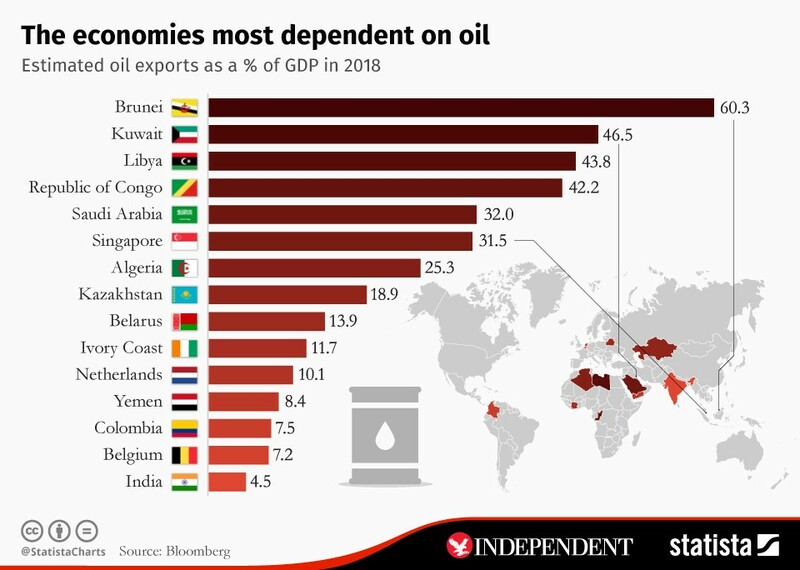 It seems so logical that countries that are well endowed with oil, gas and mineral wealth would be correspondingly economically well off; but unfortunately, oil prices and GDP of the country seem to have a non-linear relationship. Countries that produce oil tend to be poorer, more violent, more corrupt, and less productive economically than they should be. When all countries are procuring crude oil at the same price/barrel from the international market, why is there a substantial retail price difference even among neighboring nations?! When oil prices begin to soar, many governments come under pressure to shield consumers from price hikes. Hence, many countries offer fuel subsidies and try to keep domestic prices below market-based levels, subsidizing consumers. When oil prices do come down as in recent times, instead of drastically bringing down the retail prices of petroleum products, some countries resort to bank upon such good times by clearing their debt and increasing their fiscal deficit. Hence, oil prices are predicted to fluctuate in the coming decades too. Though there is nothing much we can do about it, we must start investing in alternate renewable sources of energy. Countries must find ways to become at least partially self-reliant (through one/more renewable sources of energy) to the point that their economies do not come to a standstill due to the unpredictable and unreliable nature of oil prices. Previous Post Previous post: The globally connected Yet, mutually disconnected life of Humans.